Bulawayo24 NEWS | Tanzanian President congratulates TB Joshua on his 55th birthday! 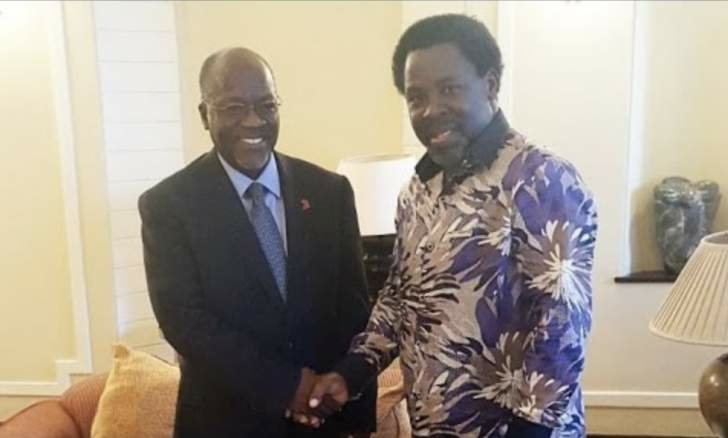 Tanzanian President congratulates TB Joshua on his 55th birthday! Tanzania's firebrand President John Magufuli is one of many dignitaries and world leaders who wished renowned Nigerian Pastor T.B. Joshua a happy 55thbirthday on June 12th2018. "Man of God, Rev T.B. 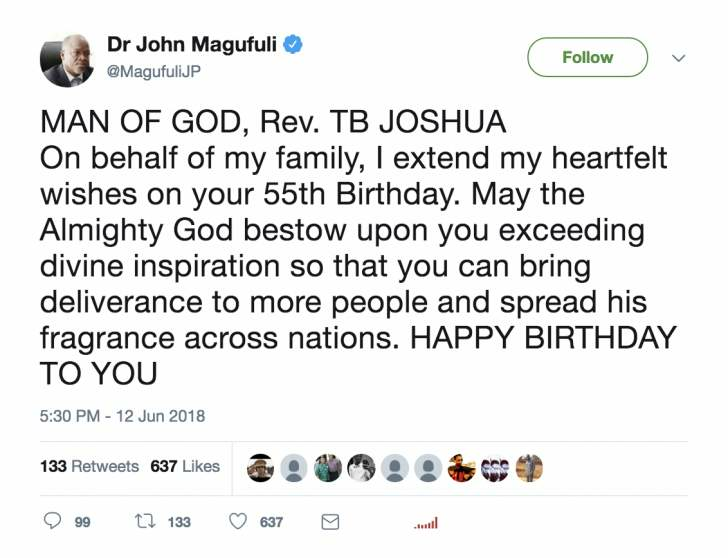 Joshua, on behalf of my family, I extend my heartfelt wishes on your 55th birthday,” Magufuli wrote on his official Twitter account, which he uses sparsely. "May the Almighty God bestow upon you exceeding Divine inspiration so that you can bring deliverance to more people and spread his fragrance across nations. Happy birthday to you,” he concluded in the message to his 432,000 followers. The relationship between the Tanzanian leader and the Nigerian pastor goes back several years. In 2011, Magufuli visited Joshua in Nigeria long before his ascendency to power, his son later testifying to being healed from a severe asthmatic condition on the trip. The influential cleric then visited Tanzania in the aftermath of the 2015 elections, playing a reconciliatory role between Magufuli and opposition leader Edward Lowassa. Since assuming power, Magufuli - known as the 'Bulldozer' - has garnered international attention for his dogged crackdown on corruption in the East African nation, winning several global awards in the process. Tanzanian blogger 'Millard Ayo', who has one million subscribers on his YouTube channel, equally posted a video reporting Magufuli's birthday message to T.B. Joshua and pictures of his visit to Tanzania in November 2015.